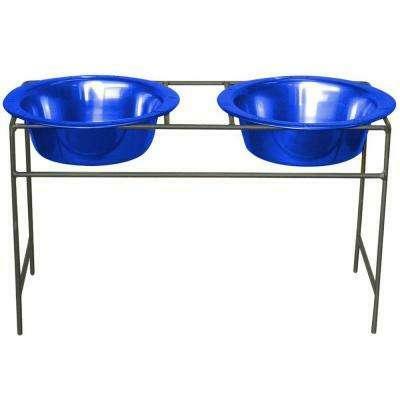 Thanks for looking at our Modern Double Diner Stand with 2 Wide Rimmed Bowls Size Color blue! The Platinum Pets Modern Double Feeder makes every meal memorable. 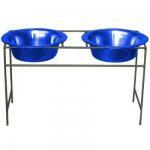 The pet feeder includes two stainless steel wide rimmed bowls designed with your canine or feline in mind. Durable hand-forged wrought iron makes up this beautiful stand with rubber bases added to the bottom of the legs to keep your pet"s food and water in place. The elegant feeder is finished with a long lasting matte black powder coat. The Extra Wide Rim bowls are tastefully embossed with paws, dishwasher-safe, and finished in a food-safe powder coat in an array of colors. With a lifetime guarantee against rust, your pet will be sure to enjoy his or her feeder for the rest of her colorful life.